During World War II, multiple aircraft companies developed an anti-lock brake system for aircraft. These were a mechanical systems designed to prevent wheel skids when planes landed at high speed on slick runways. These systems sensed spikes in brake hydraulic pressure and equalized pressures. 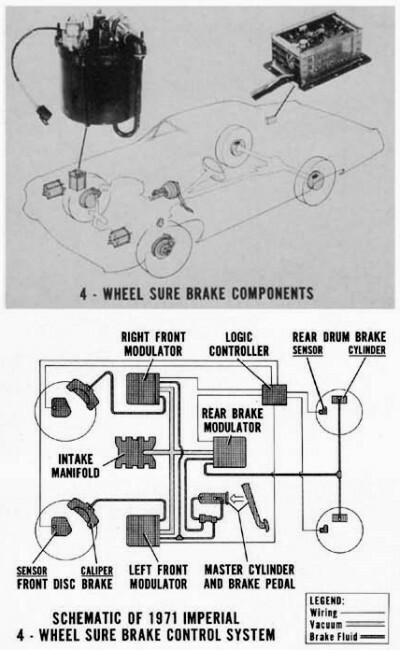 In 1958, the first practical automotive ABS system, called Maxaret, was developed by the Road Research Laboratories in Great Britain and was installed on Jensen FF sports sedans in 1966, the Ferguson P99 race car, and an experimental all-wheel drive Ford Zodiac. In 1969, the Lincoln Continental Mark III and the Ford Thunderbird were equipped with an Auto-Linear anti-lock unit developed by Kelsey-Hayes. Sensors on the rear wheels transmitted signals to an electronic module behind the glove box. The system controlled a vacuum- operated valve on the rear brake line to modulate pressure when anti-lock brake assist was needed. GM developed a similar system for its Oldsmobile Tornado and Cadillac Eldorado models for 1970 as an option. These front-wheel-drive behemoths had most of the weight of the transmission and huge V8 over the front wheels. The biggest issue with these vehicles was the self-check after the vehicle started rolling that made a clunk and change in pedal height that the customer would notice. These systems fell off the options lists in the early 1980s. Now, they are standard equipment mandated by the government as of 2009. 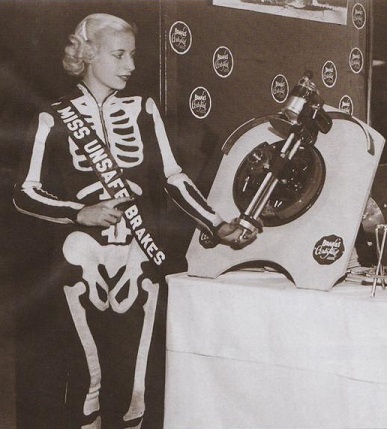 Miss Unsafe Brakes, 1939, appeared at the Chicago Auto Show dressed in a skeleton costume, to drive home the importance of brake safety. Since then, automakers have added safety features such as seat belts, headrests and shatter-resistant windshields. In 1939, 30,895 people were killed in the US on the roads. In 2012, 33,561 were killed. But, when you consider that Americans drove 10 time the miles than 1939, it is an amazing reduction. Sonja Henie won the gold medal for figure skating at the 1928, 1932 and 1936 Winter Olympics. She was hired in 1944 to be the spokes person for the National Safety Council (precursor to the NHTSA and DOT) to promote safe winter driving. In those days driving a can with four wheel drum brakes in the winter was a difficult task that required much more concentration to get the car to stop straight. 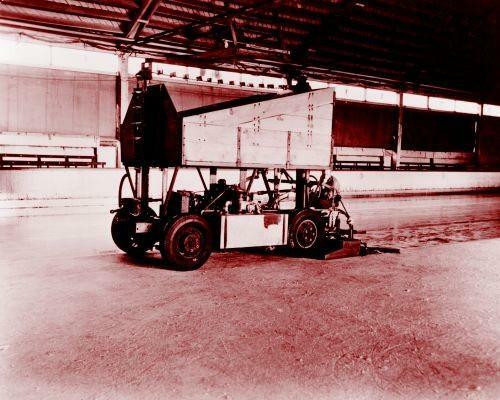 The real legacy of Henie is the she bought one of the first Zamboni ice resurfacers for her traveling ice skating show in 1950. As she traveled around the country with the odd machine that was based on a military surplus Jeep, ice rink owners took notice and orders for Frank Zamboni’s odd machine started to pour in. 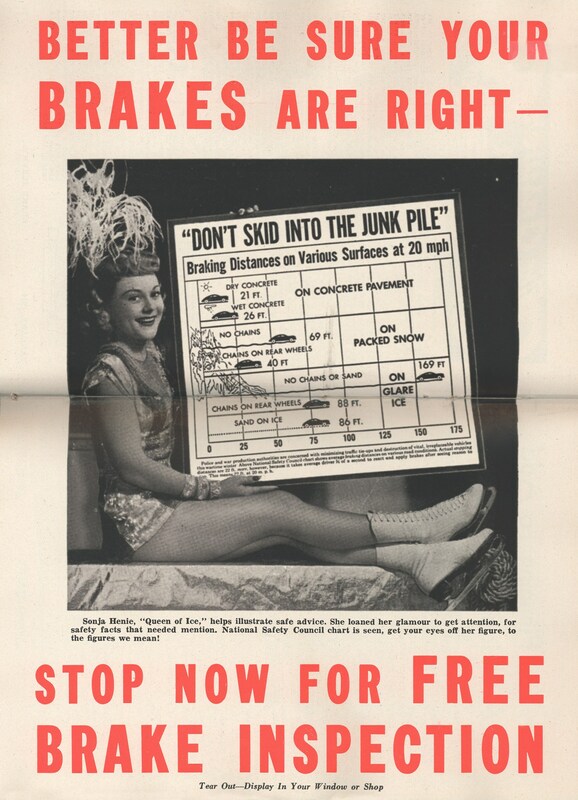 This 1950s advertisement for Bendix brake linings does not even look like an ad. No logo, tag line, not even a phone number. Just a grim accident photo and simple question that sparks the curiosity of the technician and the morbid imagination of the general public. It looks like a 1952 Chevrolet Coupe. 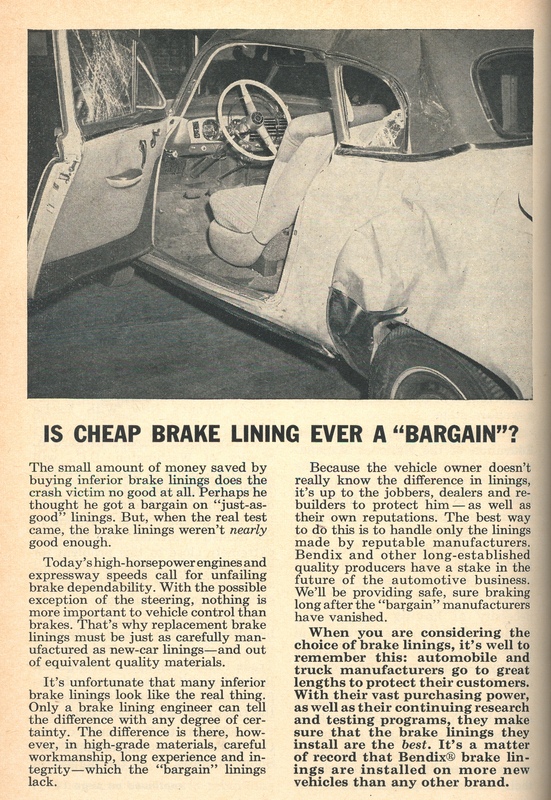 Around the time this ad was printed, the brake industry was at a crossroads. In the post-war boom, cars significantly increased their horsepower and weight in a very short time. But, how brakes and friction materials were serviced had not changed. In those days, shops could still buy a roll of friction material or a very generic friction set. As long as the could rivit the friction material to the shoes, some would do it the same way they had done it since before WWII. But, this was about to change. Bendix saw an opportunity to change the way brakes were serviced. During WWII, new adhesives were developed that could hold friction materials to a shoe without rivits. But, the adhesives could be tricky to manage at a shop level. Enter the “bonders.” These local businesses would sell you a new set of brake shoes ready to go on the vehicle. All you had to do is give them back the worn shoes so the could recycle them. It was a “Win-Win” for the shops. No more rivits and the brake shoe sets from most bonders were superior to anything they could do in house. I was going through a box of old magazines at a garage sale when I found this cover of a 1969 trade magazine. Today the opposite is true, techs are more afraid of drums than discs due to springs and self adjusters. Disc brakes had been around since the 1950s, but only on sports cars and some imports. 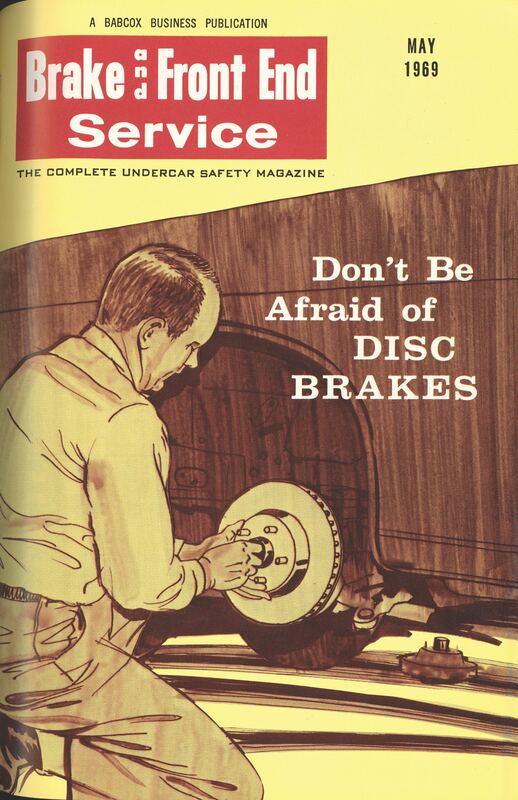 In 1969, many domestic cars were starting to see disc brakes as a standard option. It was not until around 1974 that the disc-drum set-up became standard on all domestically produced vehicles. So what were techs most afraid of during the summer of love? One of the greatest concerns was on the lathe and setting up the correct cross-feed speed. Noise was another issue. Something has to be said about an engineer willing to stand infront of a car during a brake test. 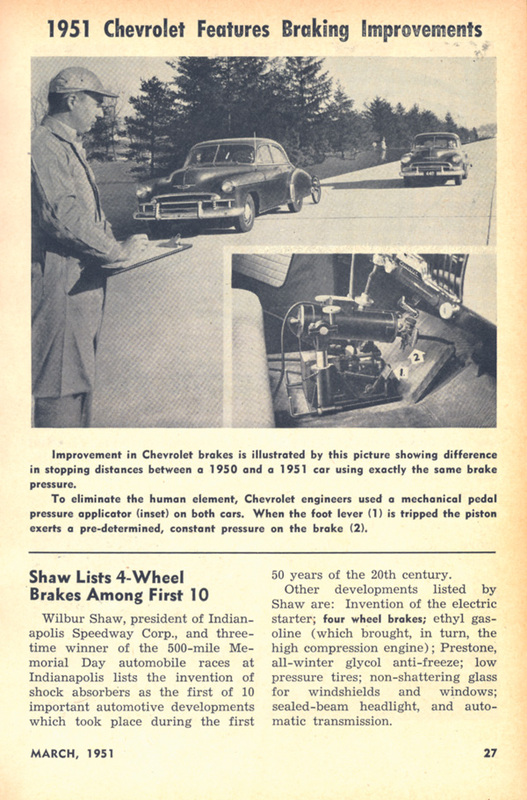 In 1951 there was not a DOT or NHTSA setting standards for braking distances. A lot of the testing took place on a big hill outside of Shanksville, PA. If the engineer and car survived the decent down a long grade, the car passed. After WWII, automakers wanted to be more scientific so they could test the effectiveness of changes to the linings, drums and hydraulics. So was born the mechanical pedal applicator. The pedal produced a constant force that could be repeated over and over.